The animals at Lahore Zoo and Lahore Safari Park have a new best friend; one that takes the form of a block of ice. They cuddle with it, snuggle up to it and even sleep on it; all in the hope of getting some respite from the heat. The zoo administration has ensured that the use of these ice blocks is increased. Around 2,000 kilogrammes of ice is being used in the cages of big cats in Lahore Zoo on a daily basis. African lions and Siberian tigers need more ice too to keep cool. 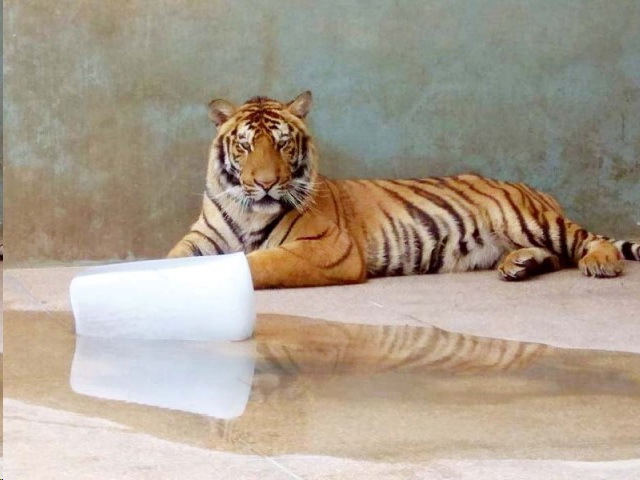 Lahore Zoo Director Hassan Ali Sukhera said with the onset of the summer season, the process of keeping ice blocks in the cages of big cats had already begun. With temperatures rising, the amount of ice being used was also increased. Around 16 to 20 blocks of ice are placed at the moment and these amount to a weight of about 2 ,000 kilogrammes, he added. He said that in addition to ice blocks, air coolers have also been kept in the cages of the tiger, leopard, lama, and puma. Moreover, these animals are also given baths two to three times a day to remain cool. On the other hand, the use of ice had been started in the Lahore Safari Park too, but on a smaller scale. Approximately 500 kilogrammes of ice is being used on a daily basis in the recreational facility. “The use of ice at the Lahore Safari Park is less compared to the Lahore Zoo because trees provide shade to the cages of lions and tigers. The shade from these trees protects them from direct sunlight,” said Sukhera. He added the lions in the cages are also given a bath.